Richard Lietz planted the Porsche 911 GT3 RSR of Felbermayr-Proton on pole position in the GTE Pro class at round four of the WEC in Britain’s Silverstone (26 August). Lietz and his teammate Marc Lieb led over the first third of the race, only to be halted when a shock absorber broke. After repairs, the Spa winners managed to salvage fourth place. In the GTE Am category, Christian Ried, Paolo Ruberti and Gianluca Roda clinched third place with last year’s 911 GT3 RSR fielded by the Felbermayr-Proton squad. The narrow and tricky street course in the million-strong metropolis of Baltimore is good turf for works driver Wolf Henzler, his teammate Bryan Sellers and the Falken Tire 911 GT3 RSR. With a perfect pit stop strategy, the German and American repeated their win from last year at round eight of the ALMS (1 September). Watched by Matthias Müller, the CEO at Porsche AG, Joerg Bergmeister and Patrick Long rounded of the top performance by Porsche at the two hour race. In the GTC class, Porsche works driver Patrick Pilet won at his debut race with Al Carter (USA) in a 911 GT3 Cup. A perfect Lausitzring weekend (25/26 August) for Christian Engelhart and Nick Tandy with the 911 GT3 R of Geyer & Weinig EDV – Schütz Motorsport: After a gripping duel on Saturday, the pair beat a Mercedes to first place by 0.4 seconds. The next victory came on Sunday, with their brand colleagues Swen Dolenc and Martin Ragginger looking good for a win, until Dolenc slid from the track with two laps to go. Engelhart now heads to the Nürburgring race (14/16 September) as points’ leader. With his first attempt at the famed hillclimb at Pikes Peak in Colorado (12 August), Romain Dumas fulfilled a childhood dream. At home in France, the Le Mans winner prepared his own Porsche 911 GT3 R. With altered aerodynamics and no restrictor on the four-litre engine, the Porsche delivered more downforce and roughly 530 hp at a weight of 1,140 kg. For the 20 kilometres and 156 corners from the start at 2,860 metres to the finish at 4,300 metres, the 911 featured a short gear ratio. Project partner Michelin supplied the cut slicks. Dumas stormed to the summit in 9:46.181 minutes to clinch victory in the Pikes Peak Open class and become the fastest rookie - despite rain and hail over the last five kilometres. Only Rhys Millen proved faster by 17-thousandths of a second in a 700+hp specially-built race car. Engine damage put an early end to Timo Bernhard’s race comeback early August. But this time everything ran smoothly. At round eight of the VLN Nürburgring Long Distance Championship (25 August) on the Nordschleife, Bernhard again sat in the 911 GT3 R of Manthey-Racing. “With slicks I set pole on a drying track. We were in the lead until shortly before the finish, despite being hit by a rival. In the end, we had to refuel and finished in third. I’m happy with my performance – it was as if I’d never been away.” Bernhard’s works driver colleague Patrick Pilet was also satisfied. The Frenchman put in an inspired drive in the Manthey-Porsche at his Nordschliefe premiere and after his first stint and an all-out effort he handed the car to his teammate in the lead. Jochen Krumbach rounded off the driver trio. After Pilet’s first race on the Nordschleife, all nine Porsche works drivers now have gained experience in the “Green Hell”. Alessandro Balzan and Giacomo Barri won Saturday’s race in Imola (1 September) in the 911 GT3 R of Ebimotors. The race on Sunday concluded with seventh place after a jostle with a rival. Still, with four races left on the calendar, the Ebimotors pilots rank second just four points behind an Audi driver. Christian Passuti and Paolo Ruberti secured second place on Saturday in the 911 GT3 R of Antonelli Motorsports and won Sunday’s sprint. Twenty-two-year-old Porsche Junior Michael Christensen came out on top against 17 other young race drivers from 15 countries and was awarded the “FIA Institute Academy Driver of the Year”. The jury’s comments: “Christensen impressed not just with his ability on the track but also his capacity for learning, his enthusiasm and strong understanding of the safety elements of the Academy’s curriculum.” The FIA Institute is dedicated to further improving the safety and sustainability in motorsport. The penultimate race weekend on the storied race track of Spa-Francorchamps (31 Aug./2 Sept.) was not for the timid. 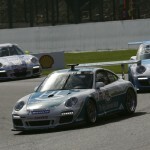 Rookie Nicki Thiim clinched his first win in the 911 GT3 Cup of Hermes Attempto Racing – from pole position. René Rast shunted Frenchman Kévin Estre from the top of the points’ table with second place. But after his fourth in Spa, Estre in second sits a mere one point off the leader. Norbert Siedler and Sean Edwards are also still in the race for the title heading to the finale in Monza (9 September). With four races to go, points’ leader René Rast and his hottest pursuer Sean Edwards have pulled ahead of the rest of the field. Twelve points separate the German driving for the Deutsche Post by tolimit team and his British rival in the 911 GT3 Cup fielded by Konrad Motorsport. The duel continues at the next two races in the Motorsport-Arena Oschersleben (14/16 September). Clinching first and second place in Imola (1/2 September), Vito Postiglione substantially increased the gap to his pursuer Matteo Mallucelli in the Carrera Cup Italia. In the Carrera Cup Asia, Alexandre Imperatori dominated at races 7 and 8 (1/2 September) in Sepang and succeeded in defending his championship lead. Jean-Frédéric Laberge and the Speed Merchants squad have won the Platinum Cup in the GT3 Cup Challenge Canada. The Gold Cup went to Bruce Gregory (Speed Merchants); Robert Seitz (6th Gear Racing) scored the Silver Cup. The Pirelli GT3 Cup Trophy USA West will run as support to the inaugural Formula 1 race in Austin/Texas from 16 to 18 November. The 21-year-old rookie Sean Johnston won the races of the IMSA GT3 Cup Challenge by Yokohama in Elkhart Lake (17/18 August). With four victories to his credit, Johnston leads the drivers’ classification. Ben Parker won both races of the Carrera Cup Great Britain in Knockhill (25/26 August), Michael Meadows still holds a clear overall lead in the championship. If you haven't already done so, don't forget to enter our contest for a chance to win $175 worth of product from Porsche Design Driver's Selection. Retro Porsche Rarity is Up For Grabs!